Palestinian religious authorities are investigating how several mosques in the West Bank city of Nablus played music instead of the call to prayer. Worshippers on Thursday had expected to hear the familiar voice of the muezzin. Instead they were surprised to hear a song by Umm Kolthoum, one of Egypt’s best-known singers. Investigators will look at whether the recording was deliberately sabotaged or if the broadcasting system was faulty. Public opinion about what happened appears divided between those that think it was unacceptable, and those that find it amusing, says the BBC’s Yolande Knell in Jerusalem. One video shared on social media shows a minaret from which the music is blasting. One man says, “What’s that?”, before saying, “a bit of Umm Kolthoum” and then giggling. The call to prayer, known as adhan, summons Muslims to prayer five times a day. 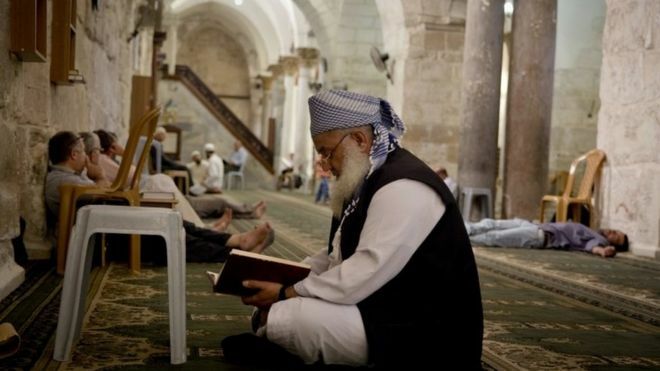 Previous controversies have involved muezzin with bad voices, or those who have accidentally left on their microphones to broadcast coughing fits or conversations. Last year a muezzin in Egypt faced disciplinary actions for changing some of the text to reference Facebook.